John Schwister and his home-built airplane, "the Minnesota Badger," at the Langlade County Fairgrounds. 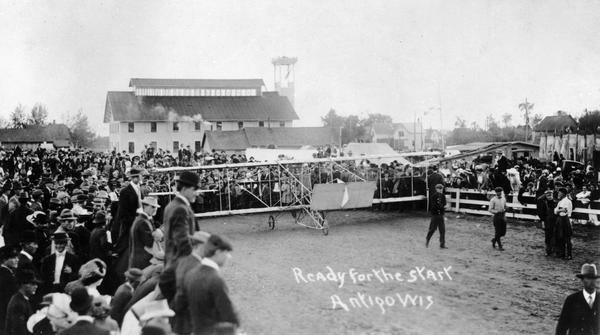 Schwister's plane, the Minnesota Badger, was so named because he designed and built it partly in Minneapolis and partly in Wausau. The Minnesota Badger was larger and heavier than a Curtiss and powered with an automobile engine. It flew with some success during 1911. The Minnesota Badger was also the first instance of a successful home-built aircraft in Wisconsin, and the beginning of what would become a strong tradition in the state.